For characters from the Legend of Korra, see here. All Your Powers Combined: Steals away the bending of others in order to further empower itself and create a new Dark (or more accurately, Anti) Avatar. Also present in Korra's Nightmare, whereupon the enemy is the merged form of all of Korra's old foes. Big Bad: Of Book Five. Later revealed to be a Big Bad Duumvirate. Black Cloak: Goes with the Cool Mask, and helps to hide their form and figure, making them harder to identify. Cool Mask: The look of a Plague Doctor, which inspires terror and helps mask their true identity. The Dreaded: Once they see what the enemy can do, Team Avatar quickly become very afraid of the idea of them and what they're attempting to do. Establishing Character Moment: Appears seemingly out of nowhere in the midst of a graveyard, terrifying its already frightened keeper, and then proceeds to raise the dead as if it was as easy as casting stones. Foreshadowing: Some of its more impressive feats occur off-screen, and are only described by Temuji and Fumiko. This sets up The Reveal that Temuji and Fumiko are the ones behind the mask, at different times. Hero Killer: While not exactly killing those whose bending it steals, it brings them close to death by sucking out their life force as well, leaving Wing, Tahno, and Daw incapacitated until the enemy is defeated. Our Zombies Are Different: Raises dead men to fight on its behalf, though they are more typically ghouls given the nature of their animation, which is rooted in actual bending techniques (albeit powerful ones). They have no free will but they continue to fight even in pieces until reduced to dust. 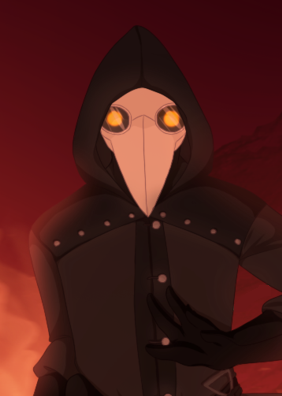 Plague Doctor: The look of the beaked mask, purposefully chosen for the terror the trope invokes. Rule of Symbolism: Someone makes a remark on how the enemy is stealing benders abilities in the reverse order of the Avatar Cycle. The Reveal: It wasn't just one person behind the mask, see below. Angrish: After his epic breakdown, he spits fire both figuratively and literally. All of the Other Reindeer: Was shunned by all but his mother because of his appearance and mannerisms. At least, thats how he sees it, the truth of the matter is a little more vague. Bishounen: Frequently described as feminine and pretty for a boy. The fan art supports this. Breath Weapon: Whenever his control slips away, Temuji has a nasty habit of doing this. Fitting since his original element was fire. Determinator: Does not know when to stop, consequences be damned. It ultimately leads to his own defeat. Elemental Eye Colors: As a red-eyed albino, plays this straighter than any firebender before in either setting of the franchise. Even Bad Men Love Their Mamas: Getting her back is the source of his turmoil. Evil Albino: At first seemingly inverted, hes one of the nicest characters you can meet. Later played straight. Expy: Of Kaworu Nagisa (aka Tabris) from Neon Genesis Evangelion. Foil: To Korra, Mako, and Asami. Korra in that they are both greatly powerful and have a desire to change the world for the better. Mako for being the elder sibling of a fire-earth duo. And Asami for having lost a parent they were very close to. Heal It with Fire: Temuji introduces a new, advanced technique that burns out infection and cauterizes wounds. Healing Magic Is the Hardest: Hinting at his status as a firebending prodigy, Temuji remarks firebending healing is not easy to master, though that is also partially because no one has an interest in learning it. It is also subtly implied that using it can be dangerous, as a slip in concentration or a misstep can do more harm than good. Incorruptible Pure Pureness: Seems to be this at first, but its later revealed to be an act. Though Temuji still seems to hold some semblance of this, viewing his actions as a Necessary Evil and being geniunely shocked when he actually kills someone. Light Is Good: Seemingly at first. Later Light Is Not Good. Not good at all. 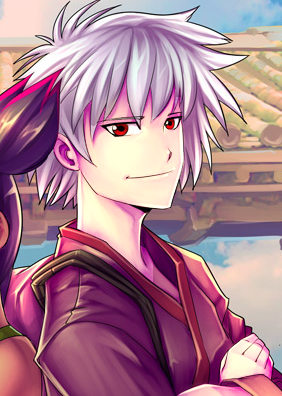 Mystical White Hair: Temuji is white-haired albino, and has great powers both naturally and as a result of his actions. Meaningful Name: As in Temujin, the birth name of Genghis Kahn. Also, six letters, just like all previous Big Bad villains of the Legend of Korra. Playing with Fire: At first, then upgrades to all four later on. Red Eyes, Take Warning: As an albino, his eyes are naturally red, and seem to avert this as first because hes a gentle soul. Goes Up to Eleven when he becomes an Anti-Avatar, and they glow briefly like hot coals in a vein similar to the Unavaatu. Savvy Guy, Energetic Girl: The Savvy Guy to Fumikos Energetic Girl. Smart People Play Pai Sho: Plays with Korra from time to time before The Reveal. Unskilled, but Strong: Possesses phenomenal power as the Anti-Avatar, but lacks restraint to use it properly, furthering the parallels between him and Korra. Villainous Breakdown: Slowly slips into a rage over the course of the final battle as all his efforts to save his mother seem futile. Walking Spoiler: Theres a reason most of his entries are blanked out. Wrong Genre Savvy: Thinks he can resurrect the dead like hes in a Mary Shelley novel. Affectionate Nickname: Miko, to her friends. Badass Normal: A modest chi-blocker and acrobatic in the same vein as Ty Lee. Later revealed to be untrue. Big Eater: Threatened to eat an Elephant-Koi whole, and seems to frequently be raiding the pantry or asking for some fire flakes. Mostly takes place off-screen though. Cute Bruiser: 14 years old, precocious, and can still take on anything you throw at her with a smile on her face. Cloud Cuckoolander: Is a bit odd, to say the least. Slightly less so after The Reveal, though Word of God it was at least fifty percent accurate, and she plays it up to throw her enemies off. Dishing Out Dirt: After The Reveal. Sandbending, specifically, though she has no skill with metal (or glass) because its too pure. Elemental Eye Colors: Seemingly subverted at first, then played straight after The Reveal. Expy: Of Miko from Transformers Prime. 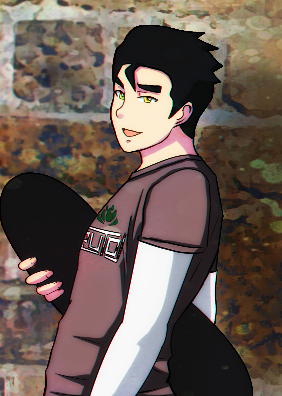 Foil: To Bolin primarily, as the younger sibling of a fire-earth duo. Girlish Pigtails: With pink highlights, no less. Perky Female Minion: To Temuji. Pink Means Feminine: Can be rather girly and attention is often drawn to the highlights in her hair. Savvy Guy, Energetic Girl: The Energetic Girl to Temujis Savvy Guy. Skunk Stripe: Its pink. The tips of her pigtails are as well. Waif-Fu: Routinely adds flips and the like to her fighting. And her daily walking, for that matter. 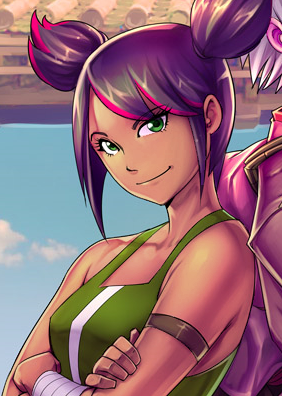 Wrestler in All of Us: Displays some moves, notably an elbow drop she uses on Bolin at one point. 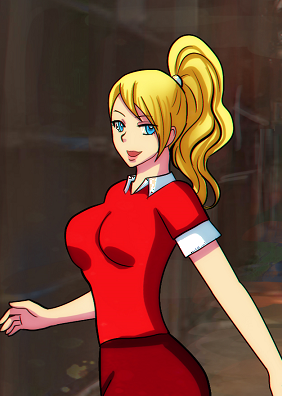 Action Girl: Wields fans with deadly skill, as befitting an old school Kyoshi Warrior. Amazon Brigade: Her and the other Kyoshi Warriors, as they still keep the old traditions. Badass Normal: Has no bending ability. Doesnt let it stop her. Combat Hand Fan: Standard Kyoshi Weaponry. Eerie Pale-Skinned Brunette: Technically its face-paint, and shes more domineering than eerie, but she otherwise gives off this vibe. Name's the Same: As Jasmine Tea. Just dont mention it around her, shes heard it a ''million'' times. Spiky Hair: Compared to a borcupine. The Stoic: Seems to have zero sense of humor. Especially in regards to her name and how it sounds similar to the tea brand. This Means Warpaint: Standard cosmetics for Kyoshi Warriors. Badass Bookworm: Played for Laughs. During the Republic Rim battle shes seen fighting off the dead... by throwing her precious books at them. The Caligula: Could be seen as a benevolent version of this. Her subjects treat her Cloud Cuckoolander tendancies with some disgust and regret, but she is honestly trying to help them out. Cloud Cuckoolander: Very... odd, to say the least. Must be hereditary, as shes implied to be a descendant of the original King Bumi, who practically defined the trope. Expy: Of Twilight Sparkle from Friendship is Magic. Hidden Depths: Her reforms do actually help the overall education level of Omashu, and when danger threatens shes quick to rally the guards and take command of the situation. Hime Cut: She has this hair style for emphasizing her regal nature. Insistent Terminology: Almost always refers to Korra as Princess, and uses the same title. Technically, shes not wrong in the case of Korra. Her own case is... odd. Badass Pacifist: Maybe, per Shrug of God. Hes only ever seen fighting dead men, and then only non-lethally ties them up in vines and promises to have them properly buried when the fighting is over. Cool Old Guy: White Lotus Grand Master, described as in his later years, and a plantbender on par with Hu from the old series, hes definitely got all three qualifications down. Gray Eyes: Emphasizing the wisdom and knowledge of an Old Master. Old Master: Not quite geriatric, but definitely past his prime, and as a Grand Master of the White Lotus, this is practically a requirement. Punny Name: Seems somewhat skittish, and his name sounds like so long to make it extra funny. Character Development: Seems to accept Tenzins offer to join the Air Nation and make something of himself following his brief appearance. Foil: To Tenzin, a young upstart against an old master. Double bonus points for being voiced by the same actor who voiced Aang from the original series, which means Tenzin is essentially schooling a darker version of his own father. Gravity Is a Harsh Mistress: How he is defeated, failing to realize his perch on a weak tree branch until Tenzin showed him. Ascended Meme: Azula drinking coffee. Character Development: Seems to have undergone quite a lot off-screen, showing a markedly different persona then she had during the era of Aang. Dysfunctional Family: Maintains communications with her brother Zuko but rarely interacts with her family, and does not seem to care for them. Also, being the Great-Aunt of the stories villain doesnt exactly do wonders for her record either. Hidden Depths: Azula seems to have gained some in the ensuing years, teaching students in secret how to firebend, as well as somewhat raising Temuji after his mother passed away. Love Makes You Evil: Inverted, Azula took in Temuji as family and seems to have mellowed as a result of it. Morality Chain: Zuko has intended to be this for her, which is why they still correspond in secret. Its unknown how well its working for his sister though, but the fact that she still answers his letters speaks volumes. Must Have Caffeine: Drinks coffee in flashbacks. Older Than She Looks: In an inverse of her portrayal during Aangs day, Azula still has quite a few black hairs left and overall less wrinkles than her brother, despite only a two year age gap. Its implied the less stressful life of an nihilistic exile as opposed to a Fire Lord and ambassador allowed her to maintain more of her looks. Persona Non Grata: In the Fire Nation. Justified, in that shes an criminally insane escaped lunatic and easily one of the most dangerous firebenders still alive. Reformed, but Not Tamed: And the reformed part is more neutral than good. Sociopath: Azula remains in fine form, not having mellowed too much in the past decades. Skunk Stripe: Now sporting a few, Azulas hair looks very skunk-like indeed. Ace: Inverted. Unlike the previous Avatars, Ban has almost zero talent at earthbending (that he knows of) and mediocre ability in almost anything else he tries, making him more of The Everyman. All-Loving Hero: Implied. He brought home an eel-hound pup for no other reason than he wanted to help it. All Your Powers Combined: Implied, by virtue of being the Avatar, but never seen on screen. Then again, he only JUST realized he can earthbend. Badass Bookworm: Is said to read frequently, and he's the Avatar (though he isn't aware of that fact at first). Blue Blood: Part of the prestigious Beifong family, though he's considered a black sheep due to his lack of bending ability (at first). Contrasting Sequel Main Character: Whereas Korra was brash, somewhat arrogant, and learned three of the four elements when she was four (in addition to learning she was the Avatar) Ban is laid-back, relaxed, calm and composed. He takes no offense to being bullied, and doesn't even realize he's an earthbender until his Avatar State awakens at age sixteen. Invoked by Word of God as a deliberate means to make a very Anti-Korra AND Anti-Aang sort of Avatar. Die or Fly: Awakens his Avatar spirit and natural earthbending seconds before being crushed. Dishing Out Dirt: A native earthbender, though it takes him a while to realize his potential. Glowing Eyes of Doom: Once the Avatar awakens, casting aside any possible doubt. Personality Powers: Ban was envisioned as the embodiment of the spiritual side of earthbending, that being neutral Jing. Subverted at first when he displays zero earthbending talent, but later played straight. Supernatural Gold Eyes: Made to help him stand out, since his other features are relatively plain and unremarkable. Tranquil Fury: Once the Avatar State activates, he shatters stone walls like they're nothing and terrifies both the thieves and Meiling, but is utterly silent the entire time. Reincarnation: Of Korra. And although the link is severed, in a way also Aang, Roku, Kyoshi, and all the others going back as far as Wan and perhaps further still. Calling Your Attacks: Meiling does this with her firebending, in order to give it more oomph. It helps emphasize how very new at it she is. Genki Girl: Is said to talk fast and often about a variety of topics. Hair of Gold, Heart of Gold: Appears that way, but it might be dyed. Either way, her kind heart is evident from the get go. Like Brother and Sister: With Ban, though its implied it could grow into more. Bald of Awesome: As befits an Air Master, to better show off his tattoos. Cool Old Guy: Member of the White Lotus, and an Airbender Master, as evidenced by his tattoos. Old Master: Not quite geriatric, but definitely past his prime. Considering he was only an infant when we last saw him in Korra's age, it really spells out how much things have changed.